A collection of 10 desserts that bring all the festive colors of Mardi Gras (purple, green, and yellow) that you can handle! Mardi Gras is next week (wait, what? It’s February? Already?) and if you’re still brainstorming what to serve at your Fat Tuesday party, worry not – I’ve got you covered.I don’t know what it is, but this year I’ve been absolutely captivated by Mardi Gras, from the food to the customs to the imagery. I don’t know what it is, but this year I’ve been absolutely captivated by Mardi Gras, from the food to the customs to the imagery. It’s officially on my bucket list to experience Mardi Gras in the Big Easy before I’m 40. So whether you’re local or long distance, you can make any (or all?) of these festive sweets to bring some Louisana flair to your next party! Take a few shortcuts in celebrating a delicious Mardi Gras with this pecan praline king cake monkey bread! Enjoy this Mardi Gras favorite the easy way: cake batter dip topped with caramel and pecans, then served with candy and sprinkle dipped pretzels. Bright sanding sugars, cold pearls, and a killer sugar cookie recipe create a festive mardi gras masquerade sugar cookie perfect for celebrating canival. French Vanilla Cupcake with a butter rum glaze and topped with a cream cheese cinnamon frosting. This cake is also inspired by Mardi Gras beads! Move over King Cake…this amazing New Orleans inspired dessert is worth adding to your party menu: Mardi Gras Chocolate Covered Oreos! These fun fleur de lis spritz cookies combine the flavors and colors of mardi gras into a delicious spritz cookie. OMG I want ALL of these, so much variety and creativity beyond the standard king cake! Where did you get the fleur Dr kiss cookie disc? Cake batter dip?! Ummmm can I just swim in this? Holy YUM!!!!! Cool ideas! Geeze, everything here looks fabulous and festive (I’m particularly partial to that monkey bread – whoa!)! I’ve never been to Louisiana (New Orleans in particular), but can’t wait to make it there some day 🙂 Great post! Love the recipe so much ^^ i will try one of this. Yes to all of these!! Wow!!! What a great — and pretty — roundup! Hard to believe it’s February, Mardi Gras, etc. 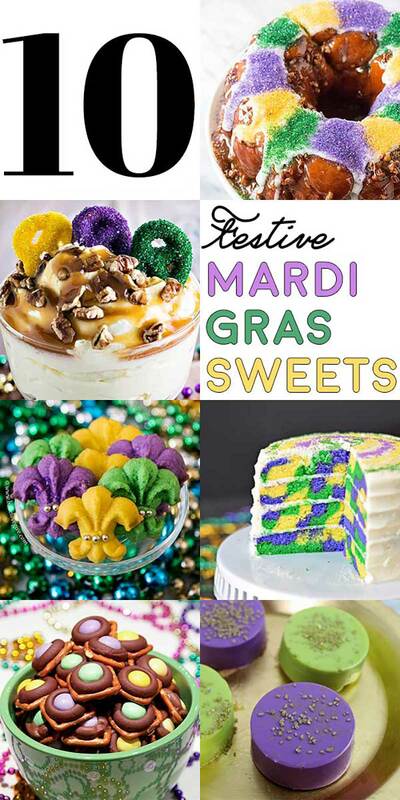 What a great roundup of Mardi Gras recipes! Yum! Want to eat them all! Especially at 37 weeks pregnant! Wishing you a wonderful Mardi Gras! These Mardi Gras treats will make the party that much better!